Ian McLoughlin (right) willl leave the club on June 30. Goalkeeper Ian McLoughlin will leave MK Dons at the end of June. The 23-year-old stopper endured an indifferent spell between the sticks in February and March while covering for David Martin. He, along with Will Summerfield, will leave the club when his contract expires on June 30. 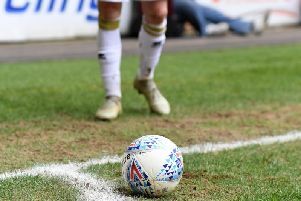 Meanwhile, new contracts have been offered to David Martin, Dean Lewington, Antony Kay, Lee Hodson, Tom Flanagan and Dean Bowditch, whose deals are up at the end of next month. Carl Baker has already put pen to paper on a new one-year deal for next season, and Karl Robinson has taken up options on Jordan Spence, Daniel Powell and Charlie Burns to keep them at the club during their first Championship campaign.